A number of questions that sometimes occur to new clients may be answered by the following Q and A. Typically copywriters can charge either hourly rates or flat fees. I prefer the latter, charging by the project, rather than the hour. This reduces the unknowns for you, the customer, by eliminating the possibility that overtime charges will inflate the final price. Factors going into determining the cost of a project include the type of copy you need along with the amount of search engine optimization for writing projects, the complexity of a website for website projects, and the details involved in graphical presentations. 1. The first step is to complete a fee agreement and make a 50% deposit before work can begin. The remaining 50% is due one week after I’ve submitted the initial draft to you for review. 2. Copywriting Information Worksheet (CIW): To better understand the information I’ll need to get going on your project, this form fills in the details. It will help me understand what you need me to create so that we are on the same page from the beginning of the project. Two sets of revisions are included with every project. They must be made within 30 days of your receipt of the copy, and shouldn’t involve a change in creative direction, scope, or format. Additional revisions will be charged at my hourly rate. Many of my clients are almost completely ‘hands off’, especially once I have understood their key marketing messages and corporate style. In these cases, a copy briefing can be done by email. Depending on the job, I may need brochures, research data, and other information that provides me with the background on your product, service, or study to help my copywriting efforts. Want to gain an edge in the highly competitive fire business? 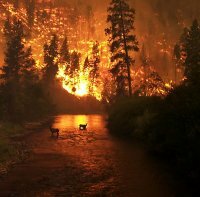 Subscribe to Wildfire News Of The Day to spot developing trends, read the latest studies, and find emerging markets locally and around the world! 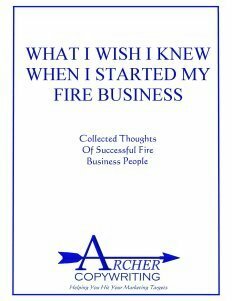 Download a free report that contains the hard-won wisdom of fire business people who learned how to survive and thrive in this competitive and ever-changing business arena.